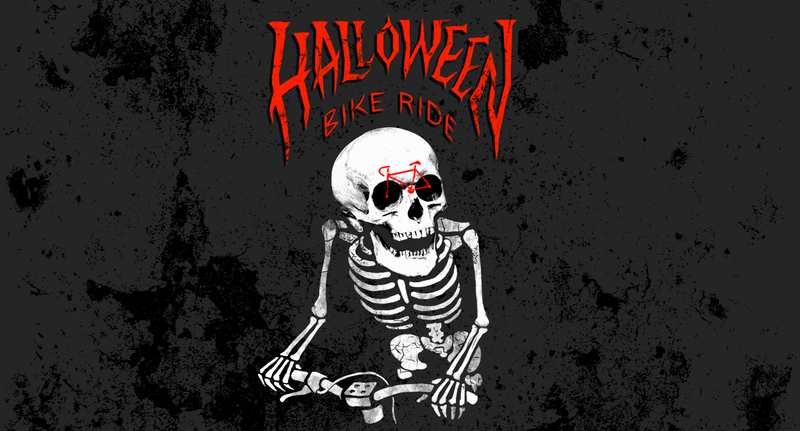 Boston Halloween Bike Ride has grown a whole lot since it began in the year 2000! Before 2015, volunteer ride marshals held car traffic at intersections so the group could stay together through intersections. In 2014, with so many riders (over 750, wow! ), we learned that it’s nearly impossible to hold intersections for more than a few minutes without angering drivers and putting riders and volunteers in danger. Even worse, the ride splintered into many groups and many people lost the ride. So even though, in terms of numbers, our 2014 ride was a great success, keeping the group together was kind of a mess. This year, we’re adopting a new group ride format to handle larger numbers where volunteers won’t hold car traffic at intersections like they used to. Instead, volunteers will only tell you when to turn on the ride so you stay on the route, a method of keeping the group together called turn marshaling. Thankfully, we’ll have support from our friends at Boston Bike Party — They’ve been testing and practicing turn marshaling successfully all summer with up to 500 riders on their rides! What this change means for you as a rider is that you will stop at red lights and stop signs, and follow directions from our turn marshals at every turn. This way, both riders and volunteers stay safe, and even when the group spreads thin, everyone stays on route and nobody gets lost! Stop at all Stop Signs and Red Lights. All riders will be riding with traffic for this ride. Do not hold or block traffic! Yield to Pedestrians at Crosswalks. Ride Straight Until You See a Volunteer Turn Marshall. Turn marshals will be stationed at every turn on the route directing you which way to go! They’ll have light-up armbands so they’ll be easy to spot! Stay to the rightmost lane except when changing lanes for left turns. Pull over to the right for Emergency Vehicles. And alert others around you to do the same. Ride straight and look out for turn marshals to stay on route! because our turn marshals will always point everyone in the right direction for the entire route. Ride the (music) Wave! Stick to a music trailer or group of people to stay with the party.We’ll have several music bike on the ride for your enjoyment, so stick to them! Make new friends if you find yourself riding alone, and if you get separated from your friends, that’s okay too, just keep following the route or pull over and wait for the wave of riders behind you. we’ll have a secret dance party regroup along the way for you to catch up then! 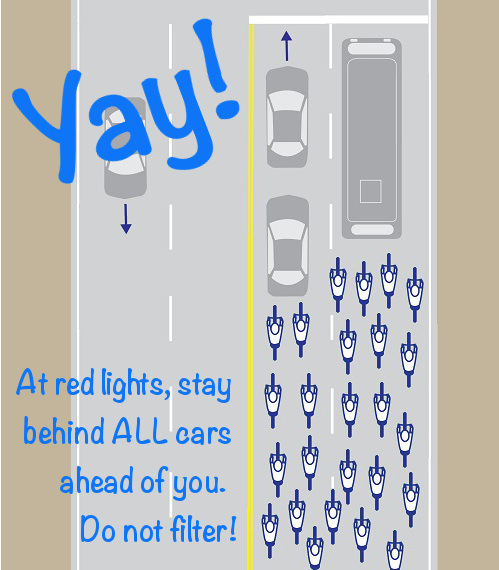 At red lights, stay behind ALL cars ahead of you. Do not filter! 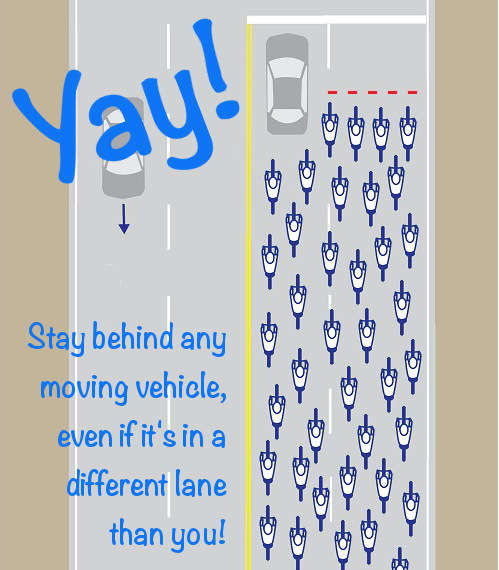 Stay behind any moving vehicle, even if it’s in a different lane than you! Do not filter through cars! 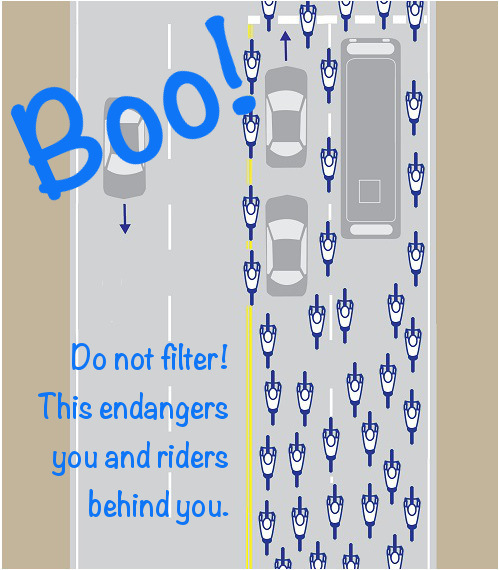 This endangers you and the riders behind you! 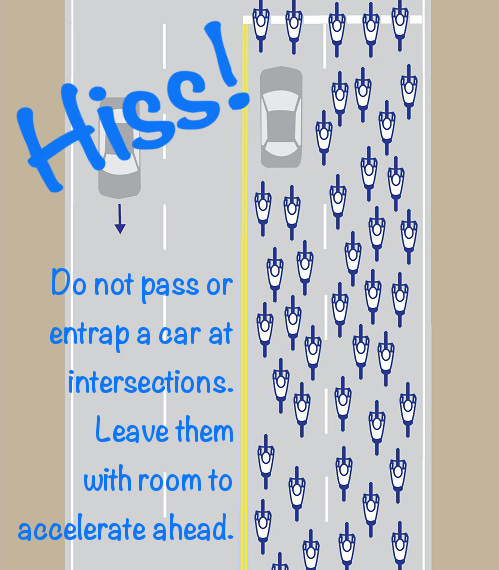 Do not pass or entrap a car at intersections. Leave them room to accelerate ahead. Stay on the right side of the street. 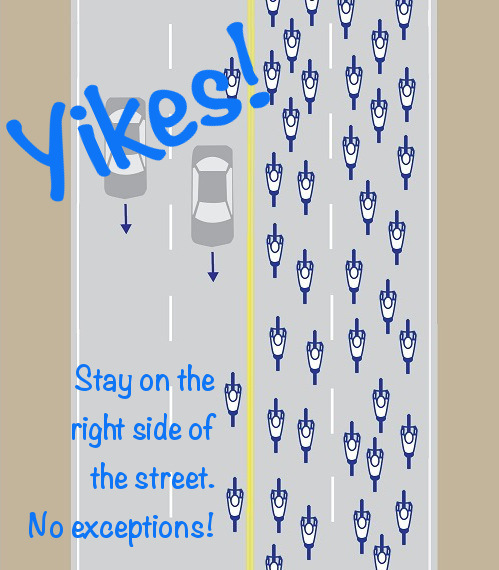 NEVER ride in opposing traffic lanes. 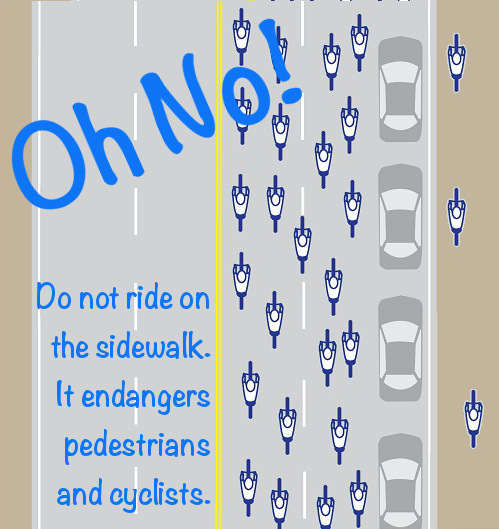 Do not ride on the sidewalk, it endangers pedestrians and bicyclists.